It takes a passion for baking to start your own bakery business, but it takes the right branding and marketing to sustain it. 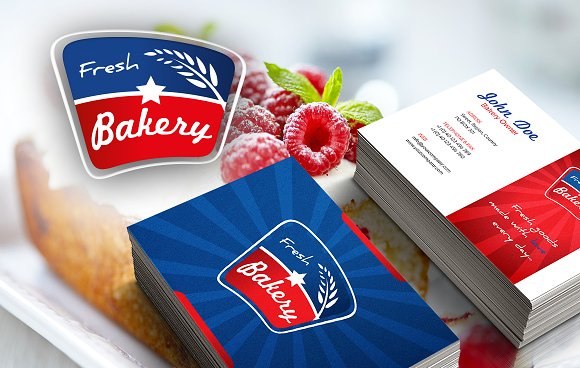 A good bakery business card needs to have an eye-catching design to get noticed and a clear message to create a memorable brand. To do this, you need to find what works best for you. 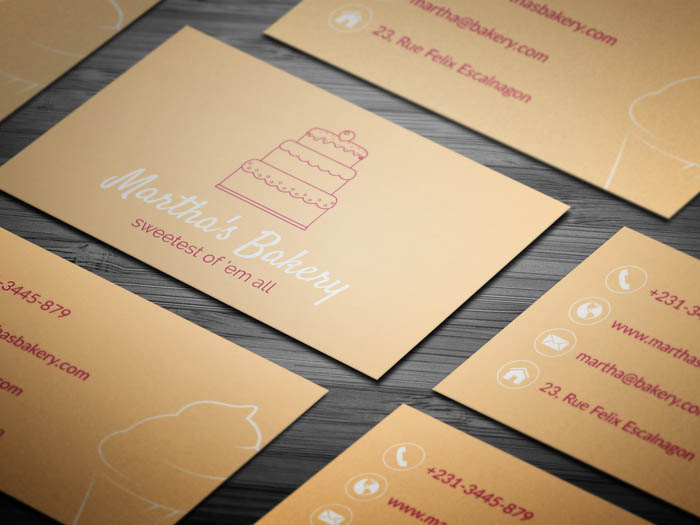 Here are 27 creative examples of bakery business cards from around the internet to inspire your next design. 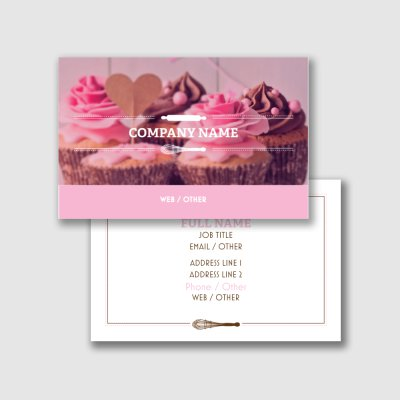 Use your products as the face of your business cards. 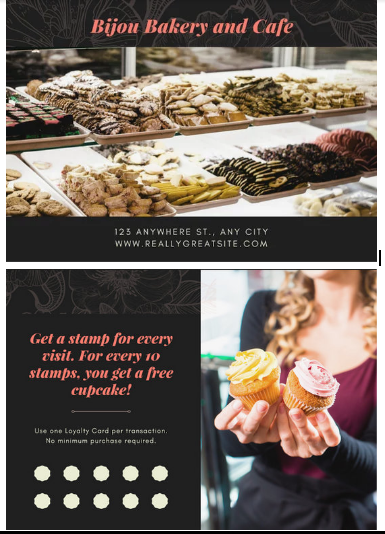 For example, if your specialty is cupcakes, add a high-resolution photo to invite cupcake lovers to visit your shop. Once you have the perfect photo, make sure your business cards come out sharp and clear by having them printed professionally with Vistaprint. 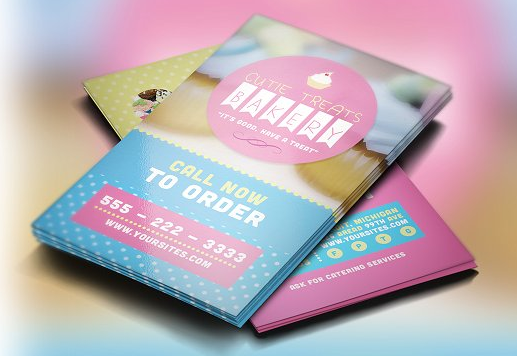 Vistaprint is the business card provider of choice for small businesses with its affordable price and great turnaround time. 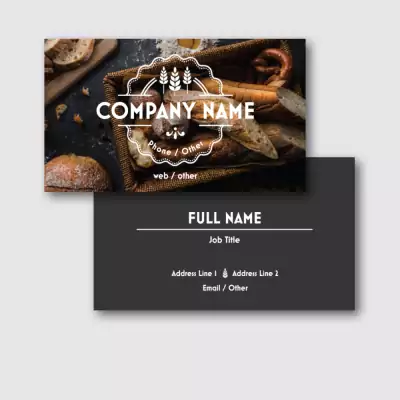 If you still haven’t finalized your business cards design, you can choose from its more than 10,000 templates or get help from one of its professional designers. Colors help evoke emotions, which is why branding should take advantage of color elements to make their business memorable. In color psychology, pink and purple provide a compassionate, nurturing vibe that’s perfect for a bakery business that’s all about delicious, homemade products. 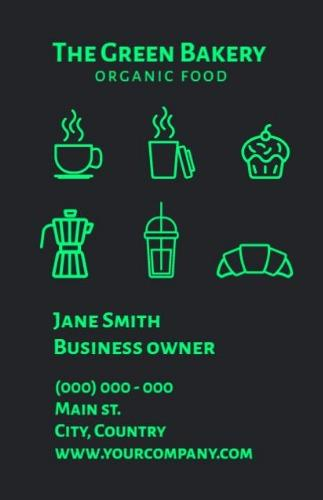 Organic bakeries are becoming increasingly popular so if your bakery’s brand is all about organic ingredients, make sure this is shown in your business card. Use colors, images or illustrations that share this message clearly. Add the word “organic” in your title and attract customers looking for your products. The key to this template is how the illustrations and fonts match to create a theme. Notice how text is used on top of an image to add emphasis to your message. The mix of dark and light colors makes this strategy effective instead of confusing. All in all, it’s a cohesive look of playfulness with a touch of nostalgic fun. 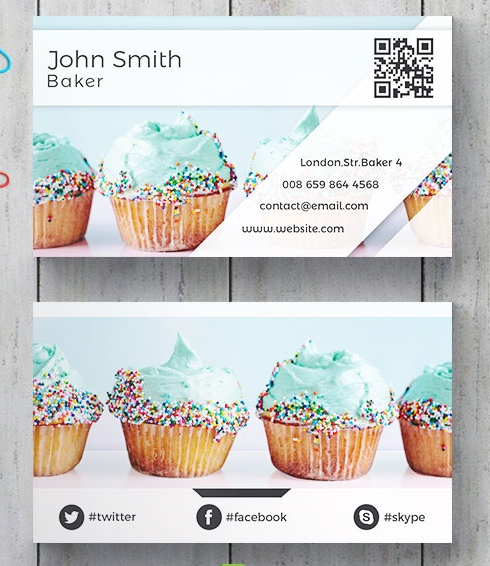 Your business card can be more than just a way to list your contact details. It can also be a note card to feature some of your best products. Write copy that gives a short but vivid description of your products to entice your customers. 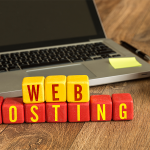 You’ll also want to have a variety of designs to make your business cards a collectible item, but working on a budget can sometimes limit your options. 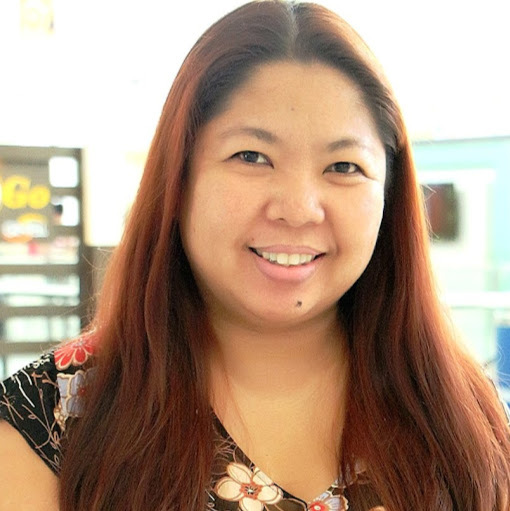 Moo offers a money-back guarantee service with its Printfinity program. Print a different design, double-sided, in full color on every business card or fix a typo or request a design change at no extra cost. You can also choose from its wide variety of designs or upload your own and customize using its online design tool. 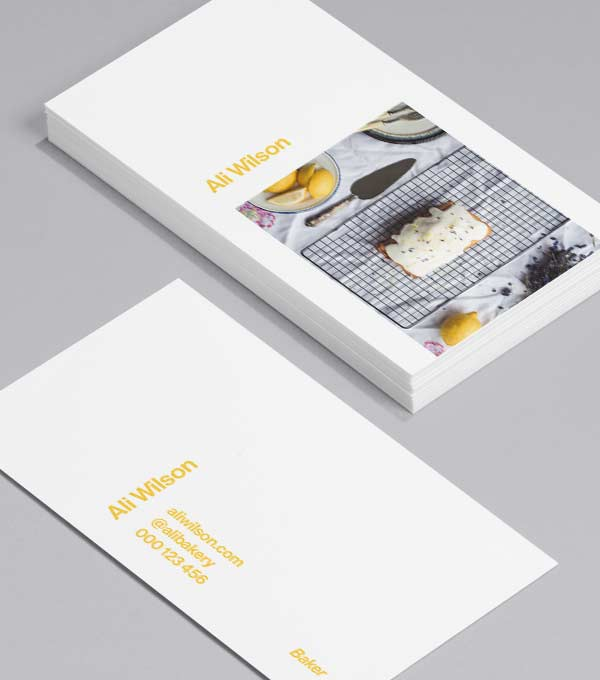 Sign up with Moo today and get started with your business card design for as low as $19.99. 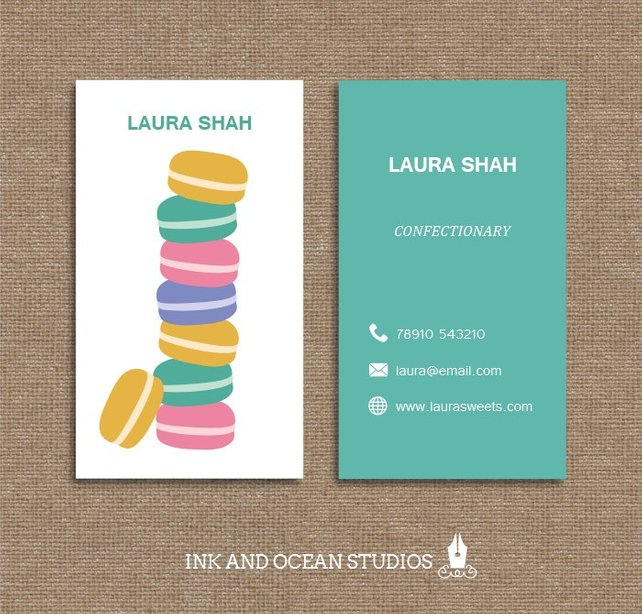 These shades of blues and pinks used on the business card are often associated with cute and bubbly themes. An oversized image of baked products in the background, topped by graphical elements in those colors creates an overall theme that appeals to a customer’s idea of celebration and fun. This template uses simple visual elements that are akin to a minimalist theme. But the patterned background adds the right impact for an impressive design. Subdued colors help make sure that your brand message is not overshadowed by the overall look. 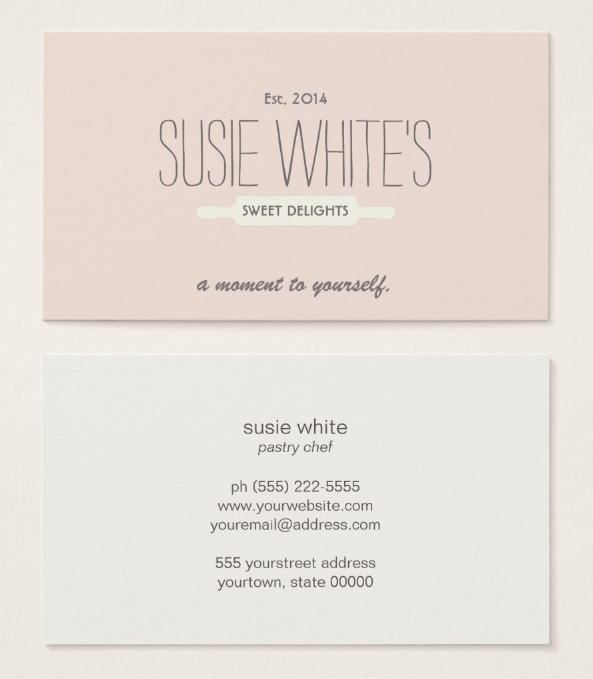 Try this soft, dainty look for your business card. Think of a countryside or boutique bakeshop and imagine the menu written on a chalkboard. 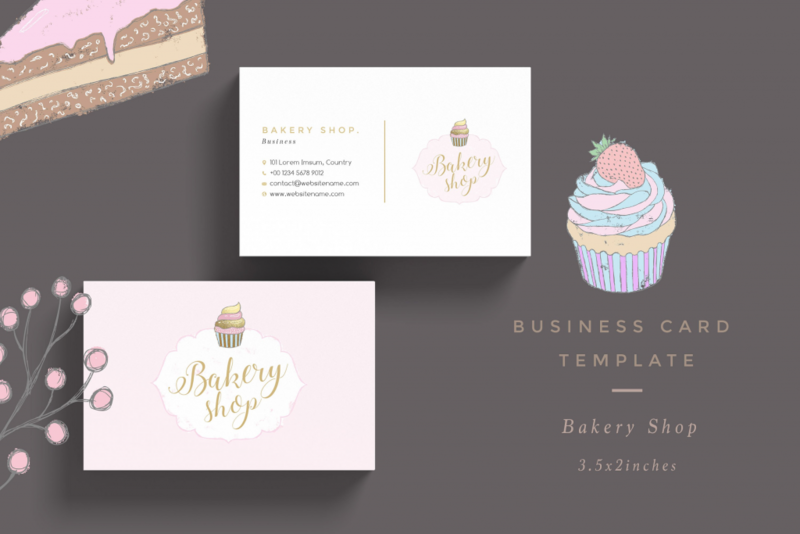 This template creates a nostalgia that every pastry lover looks for from a bakeshop. Remember that the chalkboard background is grungy so keep the layout clean and keep your fonts clear and readable. 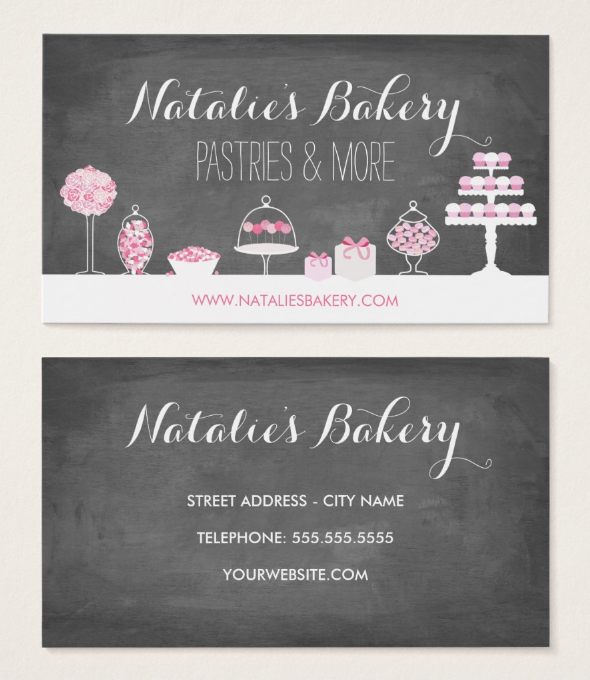 This is another example of an organic look for a bakeshop business card. This time it’s not about healthy ingredients but more of creating a home-like feel to emphasize your brand. 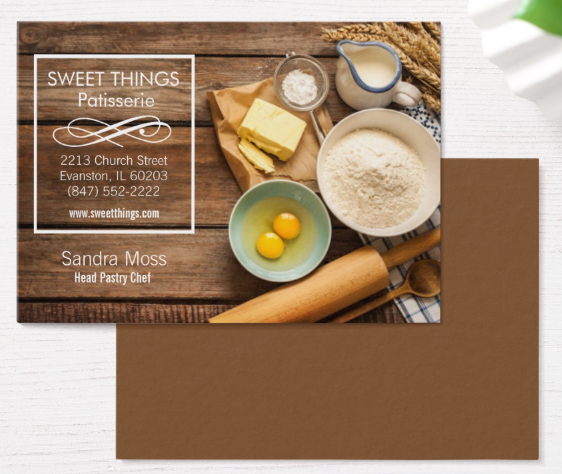 Using brown for the background and adding an image that matches the theme completes the idea of freshly baked, home recipes to impress customers with your products. 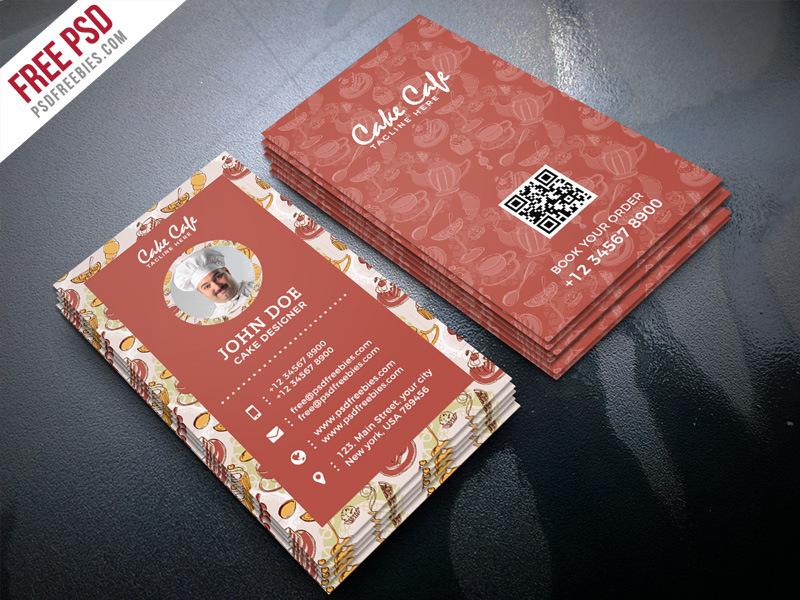 If you’re opting to add a full image on your business card, make sure the image is rich and high quality. The idea is to motivate your audiences’ senses apart from the eyes. This example shows how this crisp image can make the brain bring up the sounds and smells of freshly baked bread. Whatever design you come up for your business card, make sure you craft interesting copy that will catch the eye of your customers. This example has all the visual elements for an effective design, but what we love most in it is the impressive copy. It includes a special tagline and a list of standout features of their products. Start with a simple, clean background and add colorful illustrations of familiar symbols. The choice of a gray background in this example helps for sharper, eye-catching images. 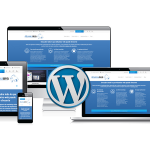 Remember to include all the information that your customers will need to reach you. 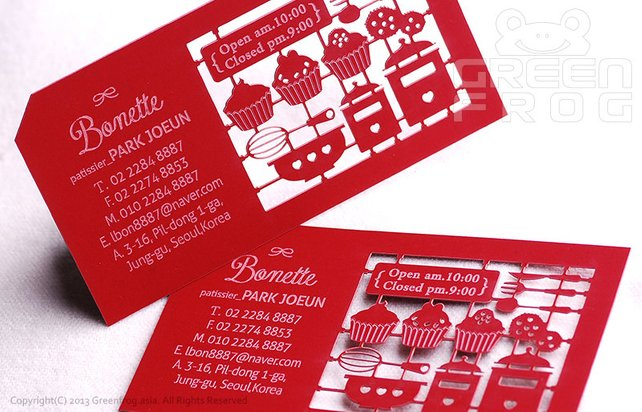 Laser cutting gives additional design possibilities for your business card. The intricate details make for an interesting feature, ideal as a conversation starter. Begin with a single color plastic type stock and use white for fonts and design accents. Notice how laser cuts and a white accent are used to create illustrations. 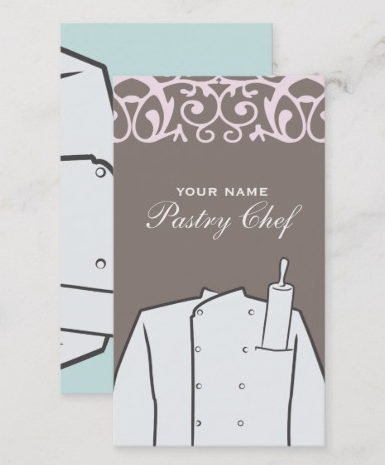 Add a headshot to create personal recognition for your pastry chef. Use colors and illustrations that show their personality. You can also add a catchy tagline that will get customers excited to know your products. Try to make the headshot larger by moving it to the side with the business name. 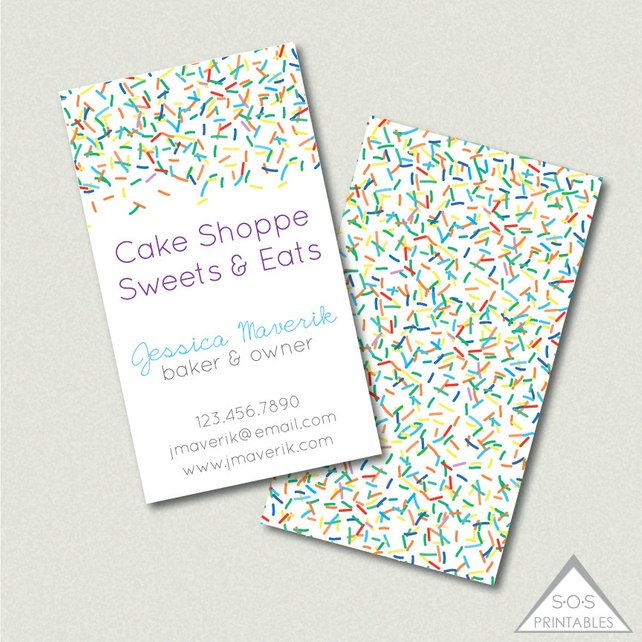 Picture-perfect baked products can catch anyone’s attention so why not put it on your business card? This example features an image showing how a fresh-baked pastry looks like, giving your audience an idea of how their favorite bread and pastries are made. The background is kept clean so as not to draw attention away from the image. There are many ways to use illustrations for your design ideas. In this example, outlined illustrations are used for the center image, background and even icons. Because the drawings are simple, be sure to choose the right background color that can help them stand out. We love this example because of the way a brand color is introduced. It’s not overwhelming because it doesn’t dominate the entire card background. Instead, color is used on the feature image itself and supported by a lighter shade just behind it. Notice how the cupcakes on the example are not exactly picture perfect but still very impressive and memorable. If your bakeshop has a unique name, pair it with an image that will help make it memorable. 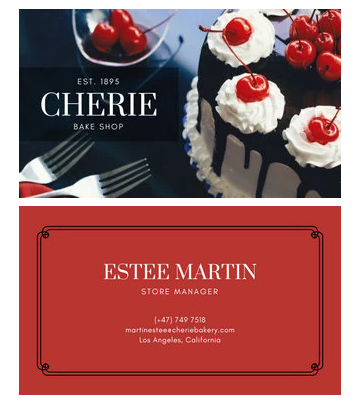 In this example, the bakeshop is called Cherie and is matched by a high-resolution shot of a black forest cake with cherries on top. Be imaginative and help customers visualize your brand using this idea. 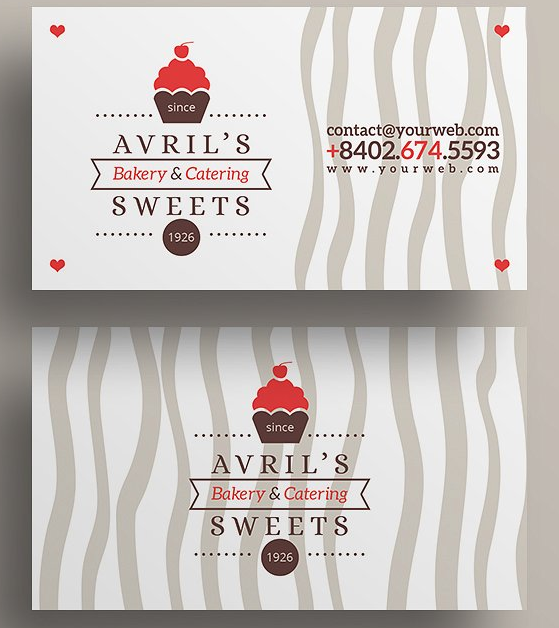 You might have noticed that this business card example is not using the standard size. This works best when it serves an additional purpose. 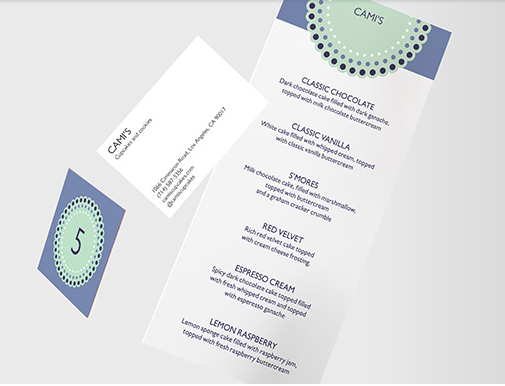 You can even make use of a foldable business card for a more interactive look. 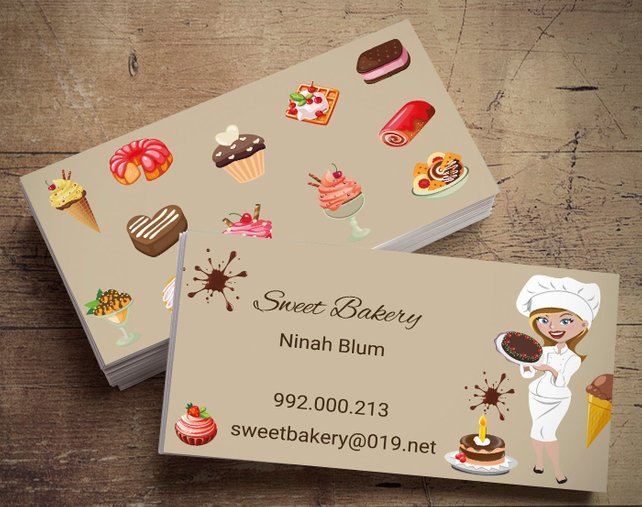 Give your customers a little behind-the-scenes look at your business by adding a pastry chef themed image on your business card. When customers love your products, they will also find it interesting to know who creates them. If you’re not keen on adding a headshot, then this illustration is a good alternative. Check out the matching patterns of the background and the cupcake drawing. This whimsical-style illustration gives your business card a more elegant feel and is an interesting look that stands out from the rest. The back of the card should be light and clean to make sure your contact details can be well read. Using an image for the background doesn’t always mean it has to be full sized. This example chose a single image to create a nice background design. The layout is clean, and the text is readable with the accent colors on the fonts matching the image background. If you have a business logo, keep it small and placed on the opposite side so as not to overwhelm the overall look. One way to design your business card is to choose a specific and recognizable symbol in your industry. This example made the creative choice of using rainbow sprinkles to add as a patterned background. Don’t limit your choices on the traditional and instead find an idea that’s unexpected but also recognizable for your customers. 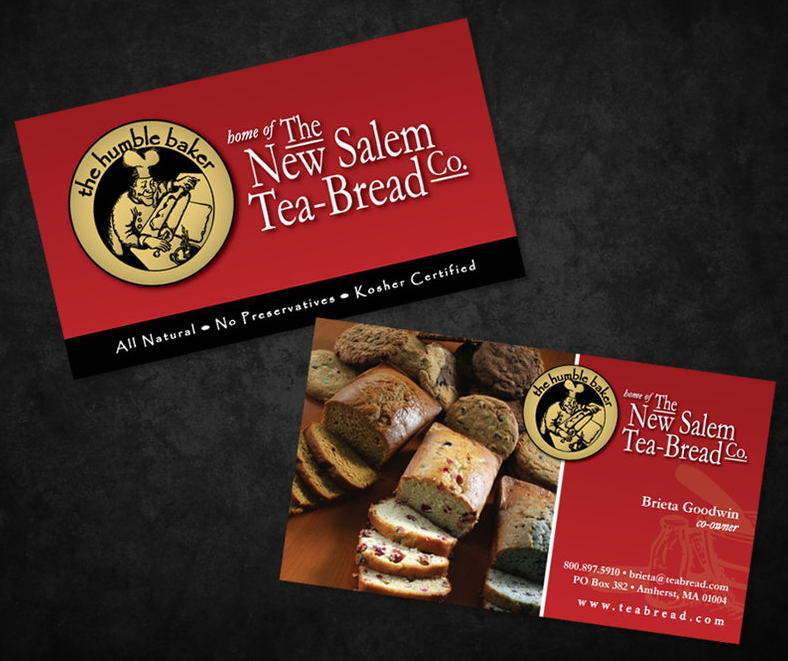 If your bakeshop focus on specialty products, make sure this is obvious on your business card. Maybe your specialty is French pastries like in the example. If so, use colors and imagery that highlights your services. Keep the elements well organized to ensure that the overall look is visually appealing. Want to create an even more personal touch? 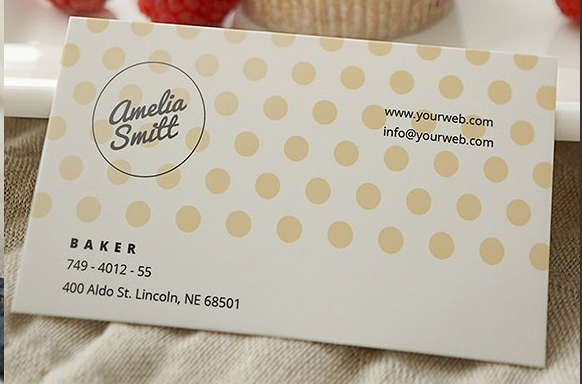 You can design a business card that simulates a handwritten look. If you do, take the opportunity to add a memorable tagline to impress your customers. Keep the layout simple and clean. Use hierarchy for your fonts to make sure that your message is clear. This is a combination of flashy and minimalist vibe. The layout is simple, and the visual elements are limited, but the lines and choice of colors create for a striking visual impact. It also ensures that the messaging is clear, creating a hierarchy that guides to catch the eye of your audience. Think macarons and cupcake icing. Pastels can create a dainty look that’s perfect for special pastries like your products. Keep it simple by using a light, simple background. Match it with an equally appealing logo to complete the theme. 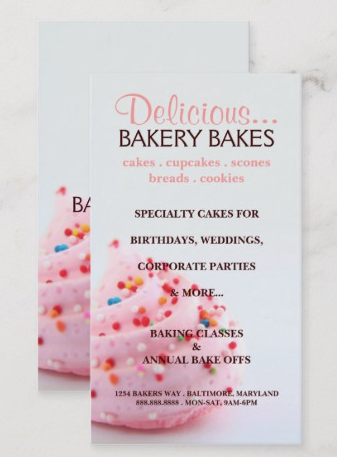 It’s important for bakeshop owners that their business cards reflect their personality to get customers excited about their products. 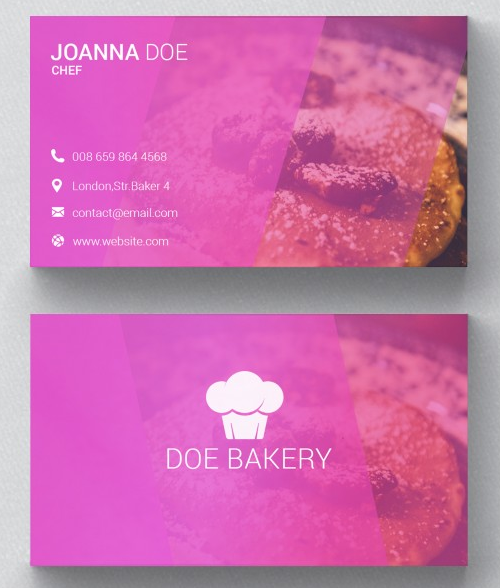 Get inspiration from our list of bakery business card examples to help you come up with a design that stands out from the crowd. 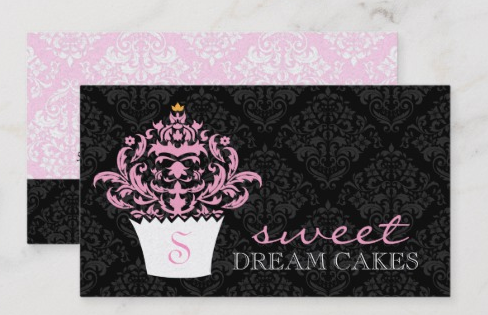 Did we miss out on your favorite bakery and cake business cards? Share them with us in the comments.